It has been suggested by one pet owner that guinea pigs with heart problems (and perhaps poorer circulation) may be prone to pododermatitis. Adequate exercise and treatment of heart problems may help these pigs. Guinea pigs are one of many animals that can suffer from this disease. In chickens, wet bedding is often blamed; in captive raptors, lack of activity and standing on a perch; rats and rabbits can also develop bumblefoot. Treatment: Pododermatitis can be difficult to cure. The advice and experience of several pet owners appears on this page in hopes that one treatment will work for you. Examine your pet regularly to catch problems early. A vet can aid diagnosis and treatment. Josephine recommends culturing the bacteria to ensure the most effective antibiotic is used. An X-ray can reveal bone involvement and help in determining prognosis. She feels that Baytril is the most effective and safe antibiotic for penetrating the bone. [By email] Susan H's vet recommended Baytril and soaking her guinea pig Chloe's foot twice a day with a chlorhexidine solution. Susan felt the swelling was not going down enough and seemed to be moving slightly up the leg. After a followup visit, her vet advised continuing treatment and said without some improvement, the foot might need amputation. She found a recommendation online to use Epsom salts to soak the infected foot and mixed 1/2 cup of warm water with 1/8 teaspoon of Epsom salts to soak Chloe's foot two to three times a day, making sure that the skin did not get too dry. Within a few days the swelling of the foot began to subside and the swelling of the leg disappeared. The vet was surprised at the improvement and advised continuing the treatment and returning in two weeks. At that time the foot was almost back to normal size and she was walking on it without any discomfort. This treatment worked very well for Chloe. Using a cap or small pill container that can comfortably fit the foot can be helpful. One guinea pig groomed itself while having its feet soaked and the epsom salt solution severely injured the eye! Do not leave your guinea pig unattended while soaking with epsom salts! This poster subsequently applied a protective eye cream (see vet) before soaking to help prevent future injury. Chii recommends an anti-septic lotion that contains 2% chlorhexidine gluconate called ResiChlor. Oral antibiotics until it clears up. Soaking foot frequently in a chlorhexidine solution. Covering with NEW SKIN Wound & Blister Dressing (ointments cannot be used with this dressing). After soaking, she lets the foot dry while holding her so it stays clean, then cuts a patch of the dressing to cover the sore. It adheres well, lets the wound drain and it doesn't hurt when removed. Note: the author has found chlorhexidine soaks to be very drying. 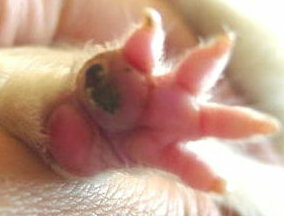 Alternating dilute chlorhexidine soaks with dilute Betadine soaks may be easier on your guinea pig's feet. Some people use a product like Preparation H after the foot is dry. V.C.G. Richardson described a reportedly successful treatment -- injecting antibiotics directly into the affected foot pad (0.2ml [20 mg] lincomycin daily for 5-7 days), an approach which may be useful for a pig with poor circulation. NOTE: lincomycin appears on the dangerous drug list and may cause complications if used. Cement antibiotic beads have been embedded in the afflicted tissue in raptors. This technique puts the antibiotic where it is needed rather than relying on distribution of the antibiotic through the blood supply when circulation may be poor. In addition, drugs not normally used due to their potentially toxic side effects but effective against the identified bacteria, may reportedly be safely administered in this local form. Jan McArthur, R.V.T describes in detail how her rats bumblefoot was treated with antibiotics, chlorhexidine rinses twice daily, Blu-Kote once daily, soft towels as bedding and daily cage disinfection. "The second the foot is totally healed. we put on a Band-aid Corn Relief cushion ( not corn removers). Do not put them on an ulcerated foot, they won't stay on. The foot has to be totally clean, dry, healed and trimmed of excess hair or they won't stay on. Follow the instructions that come with them. These include telling you to press them into place with the heat of your hand for 60 seconds. This makes the adhesive bond to the skin. The pads are waterproof and breathable and will gently fall off on their own accord 5 to 10, days later. Band-aid Corn Relief cushions for feet - regular - with Compeed moisture seal technology. "These pads are excellent for any pressure point problems on the foot pad. One of our pigs lost 2 toes on his hind foot. He started to develop a sore spot on his pad due to the new pressure point. He developed an ulcerated foot within 5 days. After the pressure bandage treatment and 6 weeks of wearing these cushions, he developed a proper new callous and no longer needs the cushions." In rabbits, Harkness and Wagner recommend cleaning the foot, trimming the nails and applying a topical antiseptic or protective cover. They note, " Frequently, treatment is prolonged and complicated by secondary bacterial infection." They discuss several methods of treatment, such as bandages or a light protective dressing combined with an antibiotic ointment, systemic antibiotics and application a soothing ointment. Be sure to read also an article by Dr. Nakamura on pododermatitis in guinea pigs. Dorcas O. Schaeffer, DVM notes that "Infection can extend deep into the tissues of the feet, traveling up tendons and into bone, resulting in osteomyelitis." V.C.G. Richardson claims it may also progress to amyloidosis of the liver, spleen, kidneys and adrenal glands. Ralph M. Bunte, DVM notes that, "Amyloidosis has been temporally associated with advanced cases. Isolated cases of pneumonia, mastitis and conjunctivitis have been seen." Harkness and Wagner suggest using a clean soft bedding, providing adequate nutrition and exercise and avoiding obesity. They conjecture that a warm, moist environment may result in thinner fur and a less dense footpad. Dorcas O. Schaeffer, DVM recommends, "Prevent pododermatitis by keeping the environment clean and dry, housing guinea pigs on soft, nonabrasive bedding, and avoiding obesity."